comet assay, DNA damage, endometrial cancer, peripheral blood lymphocytes, tumor cells. Summary. To date, genome instability is considered to be a common feature not only of tumor cells, but also of non-malignant cells of cancer patients, including peripheral blood lymphocytes (PBLs). The issue of the association between genome instability in tumor cells and PBLs, as well as of its relationship with tumor progression remains poorly understood. Aim: To evaluate the level DNA damage in tumor cells and PBLs of endometrial cancer (EC) patients with regard to clinical and morphological characteristics of the patients. Materials and Methods: DNA damage was assessed in 106 PBLs samples and 42 samples of tumor cell suspension from EC patients by comet assay. PBLs from 30 healthy women were used as control. The level of DNA damage was expressed as the percentage of DNA in the comet tails (% tail DNA). Results: It was revealed that the amount of DNA damage in PBLs of EC patients was 2.2 times higher in comparison with that of healthy donors (8.3 ± 0.7 and 3.7 ± 0.4% tail DNA, respectively) (p < 0.05). In this study, no association between the levels of DNA damage in endometrial tumor cells and PBLs was observed (r = 0.11; p > 0.05). The amounts of DNA damage both in tumor cells and PBLs were not related to the degree of tumor differentiation as well as the depth of myometrial invasion, but depended on the body mass index (BMI) of EC patients: high level of lesions was observed in patients with elevated BMI values. Furthermore, the level of DNA damage in tumor cells was associated to familial aggregation of cancer and was significantly higher in endometrial cells from patients with family history of cancer vs that from EC patients with sporadic tumors (32.3 ± 2.9 and 22.8 ± 1.8% tail DNA, respectively) (p < 0.05). It was also found that for women who had high level of DNA damage in PBLs, the risk of EC was greater (odds ratio value of 3.5) compared to those with low level of such lesions. Conclusion: Genome instability that appears as an increased level of DNA damage in tumor cells and PBLs of EC patients is associated with BMI and family history of cancer and can reflect a predisposition to cancer. Abbreviations used: BMI — body mass index; EC — endometrial cancer; PBLs — peripheral blood lymphocytes; ROS — reactive oxygen species. Today, it is well known that the formation and progression of malignant neoplasms are accompanied by extensive molecular genetic changes. The presence of various types of DNA damage and chromosomal alterations is a characteristic feature of tumor cells . According to modern notions, such changes are associated with genomic instability of malignant cells and reflect the influence of exo- and endogenous DNA-damaging factors, as well as defects in the functioning of the DNA repair systems [1, 2]. Genome instability promotes the emergence of genetic diversity, clonal evolution of tumor cells and progression of the neoplastic process . Modern studies indicate that endometrial carcinoma is characterized by the presence of microsatellite and chromosomal instability . Moreover, endometrial cells are constantly exposed to the genotoxic influence of reactive oxygen species (ROS) resulting from metabolic transformations of estrogens during the menstrual cycle . The elevated ROS level leads to the appearance of a highly mutagenic 8-oxo-7,8-dihydro-2′-deoxyguanosine, DNA breaks, apurin sites and chromosomal alterations . Furthermore, genome instability of endometrial tumor cells may have hereditary origin, in particular due to germline mutations in the mismatch repair genes in the Lynch syndrome . In recent years, numerous studies have been devoted to the problem of genome destabilization in malignant cells [8, 9]. However, today little is known about how the deregulation of genome integrity maintenance in carcinoma cells manifests at the systemic level, that is, on the structural and functional features of other cells in the body, including peripheral blood lymphocytes (PBLs). Meanwhile, in recent years, the issue of the possibility of using lymphocytes as surrogate markers (cells) that reflect the molecular genetic changes in the tumor is actively discussed [10–12]. A number of studies have shown that genome integrity in the PBLs of patients with different forms of cancer is disturbed [13–18]. Our previous study has revealed that PBLs of endometrial cancer (EC) are characterized by strong genome destabilization, in particular impaired DNA repair, which is associated with family history of cancer . However, the issue of the relationship between genome instability in PBLs and tumor cells, as well as its association with tumor progression and clinical characteristics of patients with EC, remains insufficiently studied. This study aims to analyze the association between DNA damage in PBLs and tumor cells of EC patients. In addition, the dependence of the degree of DNA damage on the clinical and morphological characteristics of patients and its significance to the risk of EC is studied. A total of 106 newly diagnosed, previously untreated patients with EC stages I and II were recruited for the study. All EC patients underwent surgery at the gynecological oncology department of the National Cancer Institute, Kyiv, Ukraine. The mean age of EC patients was 59.1 ± 1.6 years. The control group consisted of 30 healthy women, matched on age and menopausal status, with no previous or present history of cancer. All patients were thoroughly informed about the study that was approved by the Committee for Ethical Issues of the R.E. Kavetsky Institute of Experimental Pathology, Oncology and Radiobiology, National Academy of Sciences of Ukraine. Morphological analysis of tumors was performed on haematoxylin and eosin stained sections. All patients had a histologically confirmed diagnosis of endometrioid carcinoma. Information on family history of cancer was obtained through the personal interview based on a structured questionnaire. Lymphocytes were isolated from venous blood by density centrifugation using Ficoll-Hypaque gradient. To obtain tumor single cell suspensions, tumor tissue was disrupted with a MEDI machine (Becton Dickinson). After disaggregation of the tissue, the cell suspensions were filtered to remove any tissue debris. The viability of PBLs and tumor cells was determined using the trypan blue exclusion test. In order to evaluate baseline levels of DNA damage in PBLs and tumor cells, single cell gel electrophoresis assay (DNA comet assay) was performed as described previously by Olive . A suspension of lymphocytes or tumor cells (1–2 × 105 cells/ml) was mixed with 1% low melting point agarose (Sigma-Aldrich) at 37 °C, and 75 μl of this mixture was spread on slides precoated with 1% normal melting point agarose (Sigma-Aldrich). After solidification of the agarose, the slides were immersed into lysis solution (2.5 M NaCl, 100 mM EDTA, 10 mM Tris base, 10% DMSO, 1% Triton X-100, pH 10). Lymphocytes treated with 100 μM H2O2 for 5 min. at 4 °C were used as a positive control. The lysis was carried out in the dark for 1 h at 4 °C. Then, the slides were transferred to the electrophoresis chamber and incubated in alkaline solution (300 mM NaOH and 1 mM EDTA, pH > 13) for 20 min. Electrophoresis was performed in the same solution at a voltage of 0,8 V/cm for 20 min. After electrophoresis, the slides were neutralized with 0,4 M Tris HCl solution for 10 min, washed in distilled water 2 times for 5 min, dried at 37 °C, stained with SYBR Green I and analyzed with a fluorescence microscope. A total of 50 micrographs per slide were assessed using the CometScore software package (TriTek Corp.). The level of DNA damage was expressed as the percentage of DNA in the comet tails (% tail DNA). Statistical analysis was performed using the Statistica 8.0 software package (StatSoft, Inc.). The Mann — Whitney U test was used to evaluate differences between groups of EC patients and healthy women. A p-value less than 0.05 was considered statistically significant. Relationship between variables was determined using Spearman’s rank correlation coefficient (r). Logistic regression was used to calculate odds ratios (OR) and 95% confidence intervals (CI) for the association between DNA damage level in PBLs and EC risk. Large inter-individual difference in the level of DNA damage in PBLs was observed in both healthy donors and EC patients. At the same time, the range of this parameter was wider in PBLs of EC patients (1.1–21.4% tail DNA) than that of control samples (1.2–9.2% tail DNA). On average, the level of DNA damage in PBLs of EC patients was 8.3 ± 0.7% tail DNA that was 2.2 times higher in comparison with its degree in healthy donors (3.7 ± 0.4% tail DNA) (p < 0.05). Analysis of the level of DNA damage in malignant cells was carried out on tumor tissue samples of 42 EC patients (7 — well, 19 — moderate and 16 — poorly differentiated tumors). It was revealed that EC cells are characterized by a pronounced amount of DNA damage, which averaged 26.4 ± 1.8% tail DNA with individual variations ranging from 3.3 to 62.9% tail DNA (Fig. 1). To determine the possibility of using lymphocytes as surrogate cells that reflect certain characteristics of malignant cells, a correlation analysis was performed between the levels of DNA damage in PBLs and endometrial tumor cells. In this study, no association between these parameters was observed (r = 0.11; p > 0.05). Comparison of the level of genome instability with clinical and morphological features of EC patients did not reveal the relationship between DNA damage in PBLs or tumor cells and the degree of tumor differentiation as well as the depth of myometrial invasion (Table 1). However, it was found that the level of DNA damage in both PBLs and tumor cells depends on the body mass index (BMI) of EC patients. Thus, individuals with BMI values above the median (> 34.1 kg/m2) had significantly higher levels of DNA damage than those with less obesity (< 34.1 kg/m2) (p < 0.05) (Table 1). Therefore, increased DNA damage in PBLs was observed in EC patients from obesity class I (BMI 31.0–35.9 kg/m2). Note: *significantly different from EC patients with BMI < Me (p < 0.05). Pedigree analysis of all the EC patients revealed the familial clustering of cancers in 37 cases (38.9%). Most often, first and second degree relatives of EC patients had tumors of the female reproductive system, gastrointestinal tract and lungs (Table 2). For further analysis of DNA damage level in PBLs and tumor cells, a group of EC patients with family history of cancer was formed, which included women with clustering of the female reproductive system and/or other Lynch-associated tumor incidence in their pedigrees . There was no statistically significant difference in the amount of DNA damage between PBLs from EC patients with family history of cancer compared to those with no family history. 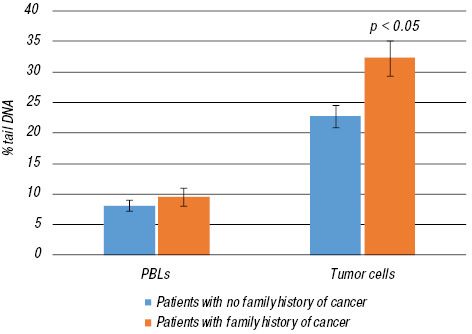 However, it was found that the level of DNA damage in tumor cells from patients with family history of cancer significantly exceeded that in cells from patients with sporadic tumors (32.3 ± 2.9 and 22.8 ± 1.8% tail DNA, respectively) (p < 0.05) (Fig. 2). In order to assess the association between DNA damage level in PBLs and EC risk, the OR value among matched case and control groups (30 EC patients and 30 healthy individuals) was calculated. According to the obtained data, the median (Me) of % tail DNA in PBLs was 3.7, on the basis of which all the examined women were divided into groups with high (> Me) and low (< Me) levels of DNA damage. It was found that for women who had high level of DNA damage in PBLs, the risk of EC was greater compared to those with low level of such lesions (OR value of 3.5) (Table 3). The issue of the occurrence and causes of genome instability in PBLs of cancer patients has been actively investigated over recent years. Results of seve­ral studies indicate a significant destabilization of the genome in PBLs of cancer patients. In particular, high level of baseline DNA damage was detected in patients with malignant tumors of breast, ovary, prostate, lungs, esophagus, bladder and kidney [13–20]. A number of studies revealed the association between the level of DNA damage in PBLs and risk of cancer [19, 20]. It is believed that an increased level of DNA damage in PBLs and malignant cells may be caused by influence of environmental genotoxic factors as well as substances released during metabolic processes in cancer patients . Very often, the effect of such factors emerges through the action of ROS that, combined with antioxidant system failure, leads to the development of oxidative stress . It is well-known that ROS are characterized by pronounced DNA-damaging properties. They can induce the appearance of single- and double-stranded DNA breaks, highly mutagenic 8-oxo-7,8-dihydro-2′-deoxyguanosine and other nucleotide modifications. It should be noted that today the genotoxic influence of ROS is considered as one of the possible mechanisms of carcinogenesis. In fact, oxidative DNA damage caused by ROS is constantly detected in malignant neoplasms of various localizations . It is supposed that the main sources of endogenous ROS are the reactions of cellular respiration, lipid peroxidation and inflammation. Along with the latter, the metabolic transformations of estrogens may have a strong influence on the development of genome instability in PBLs and tumor cells in EC patients, since these processes are accompanied by the formation of genotoxic intermediates — catechol estrogens, quinones and semiquinones which can directly bind DNA, leading to the occurrence of apurinic sites, or enter the redox reactions with ROS production [26–28]. It is possible that the high level of DNA damage in PBLs and tumor cells of EC patients with elevated BMI values may be associated with hormonal effects as far as adipose tissue is an important source of estrogen. In addition, elevated BMI values are related to increased level of circulating proinflammatory cytokines (TNFα, IL-1, IL-6, etc.) that can induce ROS formation . It is characteristic that Salinas et al. revealed an elevated level of oxidative stress markers in the blood of EC patients with an increased BMI value . An increased level of DNA damage in tumor cells in EC patients with family history of cancer can be caused by hereditary defects in DNA repair genes and tumor suppressors [7, 31–33]. Furthermore, it is assumed that there are other molecular mechanisms that determine hereditary predisposition to EC, which may also be associated with the development of genome instability [32, 33]. Thus, it was found that the risk of developing hormone-dependent tumors depends on the polymorphism of the genes involved in the estrogen metabolism [34, 35]. According to Santos et al., some polymorphic variants of such genes can modulate the level of chromosomal instability in PBLs of cancer patients . It should be noted that the issue of the underlying causes of genome instability in cells of cancer patients remains open today. There is an opinion that genome instability can precede tumorigenesis as well as it may be the consequence of this process. Actually, the development of a malignant disease may enhance the level of pre-existing genome destabilization in non-malignant cells through the effect of genotoxic substances released by the tumor on adjacent tissues and distant organs [23–25]. In conclusion, the results of the study indicate a pronounced destabilization of the genome in PBLs and tumor cells of EC patients, which may reflect homeostasis disorders in these women. It was shown that in both PBLs and tumor cells, the level of DNA damage depends on the BMI of EC patients and increases in cases with elevated values of this parameter. In addition, the dependence of the level of DNA damage in endometrial carcinoma cells on familial aggregation of cancers was detected: the amount of DNA lesions was higher in EC patients with family history of cancer. The presented data indicate the possibility of determining the risk of EC by DNA damage level in PBLs. Specifically, the high amount of baseline DNA damage in PBLs is associated with an increased risk of EC. Further studies of PBLs of cancer patients are needed in order to determine the role of genome instability of somatic non-malignant cells in the pathogenesis of the malignant disease. It is equally important to ascertain the possibility of using lymphocytes as surrogate cells that reflect the morphological and functional characteristics of tumor cells. Shen Z. Genomic instability and cancer: an introduction. J Mol Cell Biol 2011; 3: 1–3. Langie SA, Koppen G, Desaulniers D, et al. Causes of genome instability: the effect of low dose chemical exposures in modern society. Carcinogenesis 2015; 36: S61–88. Hanahan D, Weinberg RA. Hallmarks of cancer: the next generation. Cell 2011; 144: 646–4. Cancer Genome Atlas Research Network. Integrated genomic characterization of endometrial carcinoma. Nature 2013; 497: 67–73. Sugino N. The role of oxygen radical-mediated signaling pathways in endometrial function. Placenta 2007; 28 (Suppl A): S133–6. Oxidative stress and inflammation in non-communicable diseases — molecular mechanisms and perspectives in therapeutics. J Camps, eds. New York, NY: Springer Berlin Heidelberg; 2014. 223 p.
Committee on Practice Bulletins-Gynecology; Society of Gynecologic Oncology. ACOG Practice Bulletin No. 147: Lynch syndrome. Obstet Gynecol 2014; 124: 1042–54. Kandoth C, McLellan MD, Vandin F, et al. Mutational landscape and significance across 12 major cancer types. Nature 2013; 502: 333–9. Martincorena I, Campbell PJ. Somatic mutation in cancer and normal cells. Science 2015; 349: 1483–9. Herrera M, Dominguez G, Garcia JM, et al. Differences in repair of DNA cross-links between lymphocytes and epithelial tumor cells from colon cancer patients measured in vitro with the comet assay. Clin Cancer Res 2009; 15: 5466–72. Zhang YY, Gu KS. DNA repair capacity in peripheral blood lymphocytes predicts efficacy of platinum-based chemotherapy in patients with gastric cancer. Asian Pac J Cancer Prev 2013; 14: 5507–12. Buchynska LG, Brieieva OV, Nesinа IP, et al. Peculiarities of DNA repair in peripheral blood lymphocytes and tumor tissue of endometrial cancer patients. Oncology (Ukr) 2016; 18: 300–4 (in Ukrainian). Santos RA, Teixeira AC, Mayorano MB, et al. Basal levels of DNA damage detected by micronuclei and comet assays in untreated breast cancer patients and healthy women. Clin Exp Med 2010; 10: 87–92. Synowiec E, Stefanska J, Morawiec Z, et al. Association between DNA damage, DNA repair genes variability and clinical characteristics in breast cancer patients. Mutat Res 2008; 648: 65–72. Stefanou DT, Bamias A, Episkopou H, et al. Aberrant DNA damage response pathways may predict the outcome of platinum chemotherapy in ovarian cancer. PLoS One 2015; 10: e0117654. Shahidi M, Mozdarani H, Mueller WU. Radiosensitivity and repair kinetics of gamma-irradiated leukocytes from sporadic prostate cancer patients and healthy individuals assessed by alkaline comet assay. Iran Biomed J 2010; 14: 67–75. Lou J, He J, Zheng W, et al. Investigating the genetic instability in the peripheral lymphocytes of 36 untreated lung cancer patients with comet assay and micronucleus assay. Mutat Res 2007; 617: 104–10. Vasavi M, Vedicherala B, Vattam KK, et al. Assessment of genetic damage in inflammatory, precancerous, and cancerous pathologies of the esophagus using the comet assay. Genet Test Mol Biomarkers 2010; 14: 477–82. Schabath MB, Spitz MR, Grossman HB, et al. Genetic instability in bladder cancer assessed by the comet assay. J Natl Cancer Inst 2003; 95: 540–7. Lin X, Wood CG, Shao L, et al. Risk assessment of renal cell carcinoma using alkaline comet assay. Cancer 2007; 110: 282–8. Buchynska LG, Brieieva OV, Glushchenko NP, et al. DNA repair deficiency in peripheral blood lymphocytes of endometrial cancer patients with a family history of cancer. BMC Cancer 2014; 14: 765. Olive PL, Banath JP. The comet assay: a method to measure DNA damage in individual cells. Nat Protoc 2006; 1: 23–9. Kryston TB, Georgiev AB, Pissis P, et al. Role of oxidative stress and DNA damage in human carcinogenesis. Mutat Res 2011; 711: 193–201. Martin OA, Redon CE, Nakamura AJ, et al. Systemic DNA damage related to cancer. Cancer Res 2011; 71: 3437–41. Mittra I, Samant U, Sharma S, et al. Cell-free chromatin from dying cancer cells integrate into genomes of bystander healthy cells to induce DNA damage and inflammation. Cell Death Discov 2017; 3: 17015. Bolton JL, Thatcher GR. Potential mechanisms of estrogen quinone carcinogenesis. Chem Res Toxicol 2008; 21: 93–101. Samavat H, Kurzer MS. Estrogen metabolism and breast cancer. Cancer Lett 2015; 356: 231–43. Tsuchiya Y, Nakajima M, Yokoi T. Cytochrome P450-mediated metabolism of estrogens and its regulation in human. Cancer Lett 2005; 227: 115–24. Halliwell B, Gutteridge JMC. Free radicals in biology and medicine. 4th ed. Oxford, UK: Oxford University Press, 2007. Salinas EA, Wernimonta SA, Mapuskara KA, et al. Oxidative stress biomarkers and risk of endometrial cancer. Gynecol Oncol 2015; 137: 160. Wong A, Ngeow J. Hereditary syndromes manifesting as endometrial carcinoma: how can pathological features aid risk assessment? BioMed Research Int 2015; Article ID 219012: 17 p.
Bharati R, Jenkins MA, Lindor NM, et al. Does risk of endometrial cancer for women without a germline mutation in a DNA mismatch repair gene depend on family history of endometrial cancer or colorectal cancer? Gynecol Oncol 2014; 133: 287–92. Buchynska LG, Brieieva OV, Nekrasov KA et al. The study of mismatch repair in endometrial cancer patients with a family history of cancer. Exp Oncol 2015; 37: 272–6. Liu JY, Yang Y, Liu ZZ, et al. Association between the CYP1B1 polymorphisms and risk of cancer: a meta-analysis. Mol Genet Genomics 2015; 290: 739–65. dos Santos RA, Teixeira AC, Mayorano MB, et al. Variability in estrogen-metabolizing genes and their association with genomic instability in untreated breast cancer patients and healthy women. J Biomed Biotechnol 2011; 2011: 571784.